The Pliocene outcrops are quite abundant in Belgium. Local Pliocene is usually referred to as the “Scaldisian”, by reference to the Latin name “Scaldis” of the river Schelde (in Dutch, “Escaut” in French) near which Pliocene outcrops are encountered. Located in the north of the country, these sandy layers may be observed at the top of clay quarries in small cities like Steendorp, Sint-Niklaas and Tielrode. But the type location of the “Scaldisian” is to be seen in building sites and on sandy plains in the Antwerp harbour area. 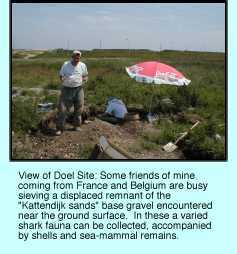 The most famous location for Pliocene fossils is seated around the well-known city of Kallo, but today best finds are made around the small village called Doel. Pliocene sediments are represented there by the “Sands of Kattendijk” at the bottom, and the “Sands of Oorderen” (Ex “Sands of Kallo”) at the top. Both layers measured together are about 45 to 60 feet thick. Sands of Kattendijk are glauconitic, black-to-green coloured sands. They begin with the four-inch-thick base gravel containing a lot of black sandstones. Very frequent here are shark teeth, generally reworked from the Miocene and often broken (several hundreds in only one cubic metre of sediment), cetacean bone parts, and dolphins tympanic bones. Less common are complete cetacean vertebra, whale ear bones, dolphins teeth and vertebra, and fish and ray teeth. Sharks are represented by the species Isurus hastalis, Isurus desori, Isurus escheri, Carcharocles megalodon, Carcharocles angustidens, Anotodus retroflexus, Parotodus benedeni, Synodontaspis vorax, Odontaspis cuspidata, Lamna rupeliensis, Lamna sp. cf. nasus, Galeocerdo aduncus, Hexanchus gigas, Somniosus microcephalus, Hypoprion acanthodon, Physogaleus latus, Sphyrna zygaena, Cetorhinus maximus, Squalus minor, Galeorhinus galeus and very rarely Hemipristis serra. This particular shark usually lived in warmer waters. Sometimes true Pliocene teeth can also be observed, being noticeably more “fresh” than reworked Miocene teeth. Centra of shark vertebrae are very exceptional finds, since in life they are only partially calcified. The rarity of these is due to the fact that shark teeth are renewable and thus lost and replaced on a regular basis, but of course their vertebrae are not. And while a typical shark may generate, use, and lose about 20,000 teeth during its lifetime, it cannot lose more than several dozen vertebrae after its death. An obvious characteristic of the Antwerp shark fauna is the size of some of the teeth found. It seems that these were significantly larger than the ones found in France and other surrounding countries. The normal size of Isurus hastalis teeth, for instance, almost never exceeds two inches from the tip of the crown to the bottom of the root. In the Antwerp area three inch teeth are regularly found and some specimens reportedly reach four to five inches high! Anotodus retroflexus, Parotodus benedeni and even Carcharocles megalodon may reach bigger sizes than the ones usually found elsewhere in Europe. It could be the amount of food in the area that attracted the biggest sharks from deeper oceanic waters (where fossilized teeth do not appear at ground level) to the relatively shallow waters of the Antwerp gulf. Maybe also only the biggest sharks in the area were strong enough to survive to the “struggle for food” in the Antwerp basin. Ray remains usually preserved are teeth of Myliobatis sp. cf. oligocaena, Aetobatus arcuatus and Torpedo sp., as well as dermal scales of Raja antiqua. Chimaeroids are represented by the big crushing teeth of Edaphodon antwerpiensis, but these occur quite rarely. Severely worn teeth from the Eocene can also be found, including the rays Myliobatis dixoni and Aetobatus irregularis, and the sharks Striatolamia macrota and Carcharocles auriculatus. Teleost fish teeth and tympanic bones are small, requiring you to sieve the sediment on a 5 mm or less mesh. The product of this sieving procedure is best treated at home, under a magnifying lens, after being washed under water on a very small mesh (1 mm maximum) to remove remaining traces of sand. 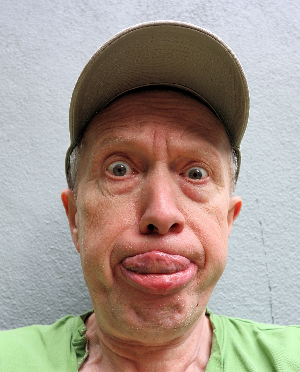 Sometimes larger teeth occur. Known here are the button-like crushing teeth of Pycnodus sp., but regularly otoliths of small fishes can be retrieved, like those of Gadiculus benedeni and Odontogadus pseudaeglefinus. Bigger otoliths of the fish Melanogrammus conjuctus are also scarcely represented in this layer. Mammals remains are well present, too. We can recognize skeletal parts of whales (bones, vertebrae, teeth, otoliths) from the species Balaena sp., Balaenula sp., Balaena primigenia, and sperm whales like Scaldicetus grandis, Physeterula dubusi, and Squalodon antwerpiensis. Very rare are the stair-like molar teeth of Squalodon antwerpiensis, ancestor of our present-day cachalot. Also regularly retrieved are remains of dolphins (vertebrae, teeth, otoliths), the most frequently found species being Eurhinodelphis cocheteuxi, Delphis sp., and Acrodelphis scheynensis. Up to four distinct shapes of tympanic bones have been distinguished in these sediments. Seals are also known from this deposit, and again essentially by fragmentary remains (miscellaneous bones and teeth). Phoca vitulinoides and Palaeophoca nysti exist but do not abound here. Very infrequent are bones of marine birds. Two of these have been found in the gravel at Doel and one at Cadzand. Black sandstones often fossilize internal and external moulds of various molluscs, their shells having been dissolved away. Pelecypods are represented (the genera Glycymeris, Dosinia, Pecten, Panopea, Nucula, Glossus) but also gastropods (the genera Natica, Scaphella, Conus, Turritella, Ficus, Xenophora). Even one species of echinoid is known, the irregular Schizaster sp. It is unclear if these are real Pliocene invertebrates or material reworked from the Miocene. Presence of Ficus, Conus, Xenophora and Schizaster very probably indicate reworked Miocene fauna. Some crabs fossilize in phosphatic pebbles and are quite rarely found. We encounter Coelema rupeliensis and very rarely Tassadia carniolica. The burrows Tasselia sp. are frequently collected in black sandstones. Above the base gravel, green sands occur that contain numerous cetacean bones and vertebrae, and also lovely preserved shells. These include Pecten praegrandis, Pecten complanatus, Glossus humanus, Glossus lunulatus, and Terebratula variabilis. These green sands are still part of the “Kattendijk sands” and are rarely seen outside harbour works. Higher in the “Kattendijk sands” we can observe a small layer, the “Petaloconchus horizon”, which is a true reef essentially built from millions of shells of the small vermetid gastropod Petaloconchus intortus. Other molluscs also lived there, including Arca sp., Barbatia sp., Narona jonckairiana, Pseudamusium gerardi, Ostrea sp., Turritella incrassata, Cirsotrema crassicostatum, Glans aculeata and a lot more. Brachiopods are Terebratula variabilis and the small Tegulorhynchia nysti. Shark teeth appear more scarcely in that horizon, but the first confirmed teeth of Carcharodon carcharias have been retrieved in this layer. Fish otoliths are more common stuff. The highest shell layer in the “Kattendijk sands” is quite famous in the country, since it contains a rich and wonderfully preserved elasmobranch (shark and ray) fauna. Although being Pliocene in age, the shark species show real affinities with Miocene sharks. Shark teeth and other vertebrate remains encountered here are mainly the same that can be retrieved in the base gravel, besides Carcharodon carcharias teeth which have been found here, being not represented in the gravel. Cetacean bones and otoliths are also fairly common. We can also find occurrences of the brachiopod Terebratula variabilis. Covering the “Kattendijk sands”, we can observe a transgressive load cast essentially composed of broken shells. Above this begins the “Oorderen sands”, very famous for the exquisitely-preserved molluscs it contains. Thousands of specimens of several dozen species have been found when digging the harbour docks, and very many can still be retrieved in the sandy plains scattered in the harbour. Most frequent here are the clams: we can dig out single or double-shelled pelecypods — Arctica islandica, Pygocardia rustica forma typica, Pygocardia rustica forma defrancei, Atrina fragilis, Astarte omalii omalii, Astarte omalii basteroti, Astarte striata, Laevicardium decorticatum, Pecten gr. praegrandis, Pecten complanatus, Pseudamusium gerardi, Chlamys pusio harmeri, Aequipecten radians, Cyrtodaria angusta, Angulus benedeni, Dosinia casina, Dosinia exoleta, Lucinoma borealis, Cerastoderma edule, Ostrea edulis, Mytilus edulis, Glossus humanus, Nuculoma haesendoncki, Gari fervensis, Cyclocardia chamaeformis, Cyclocardia orbicularis orbicularis, Cyclocardia scalaris, Barbatia barbata, Corbula gibba, Gastrana laminosa, Glycymeris glycymeris pilosatumida, Glycymeris glycymeris variabilis, Nucula nucleus, Pododesmus patelliformis, Glans aculeata, Timoclea ovata, Mya truncata, Panopea faujasi, Lutraria lutraria, Thracia inflata. Snails are also common in the Oorderen sands, the following species of gastropods can reasonably be found : Neptunea contraria, Neptunea antiqua despecta, Terebra inversa, Scaphella lamberti, Leiomesus dalei, Hinia reticosa (different forms), Natica millepunctata, Euspira catena, Euspira catenoides, Gemmula antwerpiensis, Gibbula octosulcata, Capulus ungaricus, Capulus ungius, Lepeta scaldensis, Calyptraea chinensis, Emarginula crassa, Genota intorta nysti, Nucella lapillus, Nucella tetragona, Aporrhais pespelecani quadrifida, Aporrhais scaldensis, Colus curtus, Atractodon elegans, Buccinum undatum, Galeoda bicatenata, Calliostoma zizyphinum, Calliostoma simile, Trivia coccinelloides, Trophonopsis muricata, Hinia consociata, Amyclina labiosa, Scaphander lignarius, Scalaria sp., and Turritella incrassata. Other molluscs represented are scaphopods, not very abundant, but some species can be observed: Dentalium sexangulum, Dentalium sp. cf. dollfussi, Dentalium sp. Brachiopods are not too common, but some Terebratula variabilis and Lingula dumortieri have been collected. Echinoids are pretty infrequent stuff, but small pieces of Echinus lamarcki and Strongylocentrotus pallidus have been discovered. 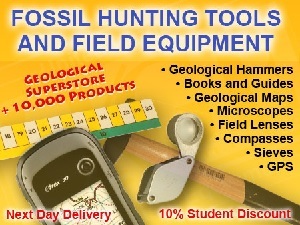 Some ichnofossils (or trace fossils) can often be retrieved: Tasselia ordamensis is a fossilized burrow. Vertebrate remains are very scarce in the “Sands of Oorderen”. Some very nicely preserved shark teeth occur occasionally, like Isurus hastalis, Isurus desori, Lamna nasus, and Carcharodon carcharias. Nice fish and shark vertebrae are rather common stuff, but the most frequently encountered remains of fish are the heavy otoliths of Melanogrammus conjunctus and big dermal scales of Raja antiqua which both can locally abound. Mammal remains found are the vertebrae and isolated bones of whales and dolphins. Outside of the Antwerp harbour area, both Scaldisian layers seem to be condensed in a six-to nine-feet-thick yellowish sand which begins with a four-to-twenty-inch-thick bonebed relatively rich in shark teeth. 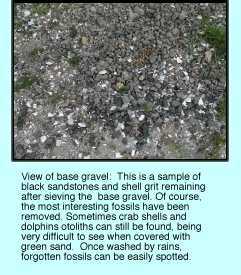 Although small gravels are contained in this bed, bigger black stones are only exceptionally encountered here. These sands can be observed at the top of two clay quarries around the small villages of Steendorp and Tielrode. This yellow sand is very rich in molluscs and delivers the same Pliocene species. Here shark teeth are more scarce than in Antwerp harbour, but these are generally better preserved. Cetacean bones are more frequently encountered and whole vertebrae are quite common. In Sint-Niklaas clay quarry, a totally different facies of the “Kattendijk sands” is to be seen. Above the clay, a small irregular layer of glauconitic grey sand containing very small chert pebbles is very rich in fragmentary cetacean bones and shark teeth. But with the exception of some phosphatized internal moulds of crabs, invertebrate remains are virtually nonexistent. Unhappily it is not easy to obtain an access authorisation to some of those quarries. Another very pleasant location for easy-to-find Pliocene fossils (vertebrates and molluscs) is located at the Belgium-Netherlands border, about fifty miles away from Antwerp and five miles from Knokke. Near the cities of Cadzand-Bad and Nieuwvliet-Bad, shark teeth and other fossils from the “Kattendijk sands” and the “Oorderen sands”, extracted from offshore deposits, are thrown on the beach by storms. The obvious result is that best finds can be made in winter and spring. At low tide, people walk on the sand to retrieve these fossil remains, which can locally be concentrated and mixed together with present-day shells. After carefully having looked on the beach, one can dig about five to ten inches deep under sand level to reach a “present-day base gravel” containing Pliocene shark teeth and other vertebrate remains together with black sandstones. This is best sieved on a 5 mm mesh in sea water to wash all sand away for easier discoveries. 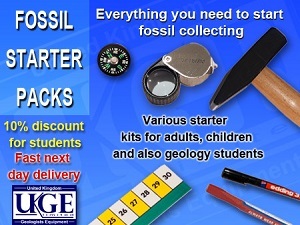 There kids and grown-ups alike can really enjoy finding fossil shark teeth at sea border.